Mary and I recently made the trip down to Greer, SC to attend the closing celebration of The ICON exhibit. This exhibit was at the BMW CCA Foundation Museum. The ICON exhibit celebrated the 50th anniversary of the introduction of the 2002, which is one of BMW’s most loved models. We flew from Portland to Greenville via Detroit, arriving late Wednesday night. On Thursday we visited several museums and parks in Greenville, including the Upcountry Museum, the Music Museum, and the Falls Park on the Reedy. Macs Speed Shop- Beer, Bikes, & BBQ; the three B’s everyone loves. 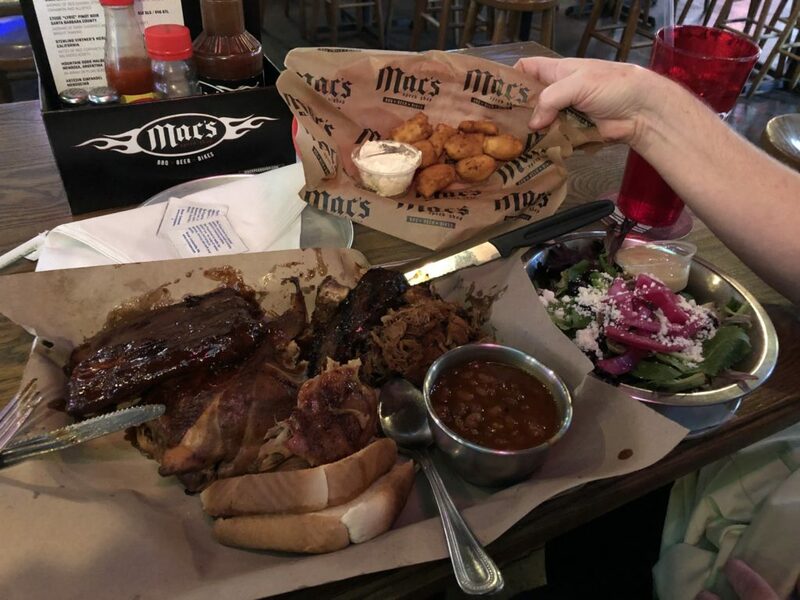 When one visits South Carolina one thinks of BBQ so we went looking for the best BBQ in Greenville. We found it at Mac’s Speed Shop- Beer, Bikes & BBQ. It is on South Main Street, and it is fantastic. Friday morning we went over to the BMW CCA Foundation Museum to check on the car and see if the staff there needed any help getting ready for the coming celebration. At 1:00 we had a reservation at the Performance Driving Center. They were putting on a special program for those coming for the celebration. After a short orientation meeting we headed out for 3 driving experiences. The first experience we did was to drive one of the new X5’s on their off-road course. BMW has done an amazing job with this car giving it impressive off-road capabilities while keeping its comfort and cruising personality. Second we had a chance to challenge for FTD on an autocross course in a new M240i. I really like this car, It seemed to me to be the closest thing to a modern 2002. It is small, light, nimble, and has ample power to give a thrill. The best came last. We jumped in one of the new M5’s and got to turn some hot laps. What’s not to like about 600 HP, 550 ft/lbs of torque, and 0 to 60 in 2.8 seconds? The car handles like one of my race cars! The full-time FWD pulls it through the corners like a freight train. What fun! 4 historic 2002 race cars ready to do their thing. Following the driving experiences we had a chance to get the four race cars that were part of the exhibit on the track for some demonstration laps. The cars were driven over from the museum and lined up in the staging area. Each owner took a few minutes to tell about the car and its history. Then we took them on track for some fun. Saturday morning we had a one hour tour of the factory. 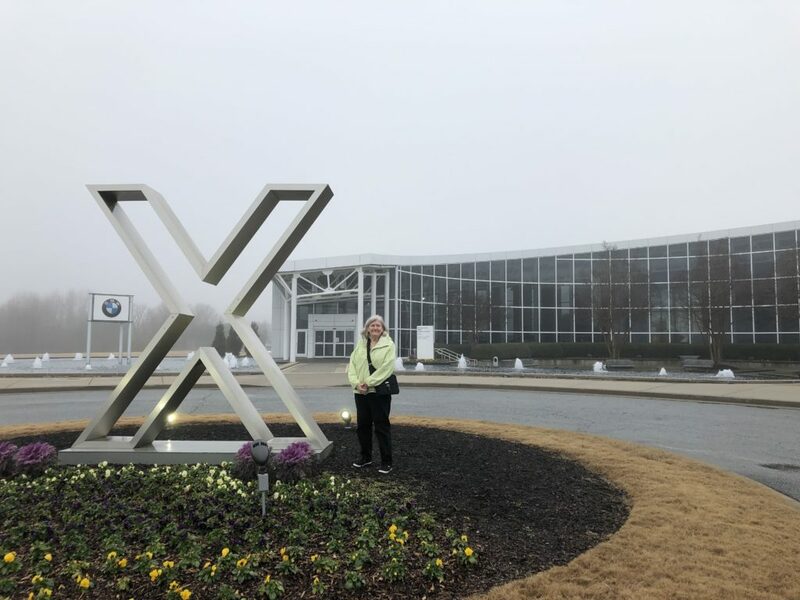 The tour began in The Zentrum Visitors Center where a dozen historic BMWs were displayed along with examples of the X cars produced at the factory. The Spartanburg factory is BMW’s largest manufacturing facility. The Spartanburg plant is BMW’s largest manufacturing facility. It produces 370,000 X vehicles a year, 80% of which are exported. The plant operates as a ‘just-in-time’ manufacturing facility. This means parts for the cars arrive at the assembly line as they are needed, and in sequence. the logistics for all this to happen are mind blowing. Saturday night was the closing celebration. Just over 200 people packed into the museum to enjoy finger food, drink some good Oregon wine, and listen to the guest speakers. These included Rob Siegal, The Hack Mechanic, Jackie Jouret, Tom Plucinsky from BMW NA, and Andreas Bovensiepen from Alpina.We had a great time and met some wonderful BMW lovers. A special Thank You to Scott Dishman and Michael Mitchell for all their work making this happen.